This morning I woke up and it felt like Fall was in the air. It was cool out, a little breezing, I actually wore a fleece zip up jacket. Little did I know, there was more than Fall in the air….LOVE was in the air too! There are so many memories growing up on this farm. It starts long before my time. My Dad was brought home to this farm when he was born, which shows how many years of memories our family has here. I remember walking in the fields, trying to go between the electric fence without getting zapped; sitting on the side hill by my favorite tree and playing as only young kids can play; sliding down the chicken coop on our bottoms; watching our dog Nero run up the ladder to the hayloft; breakfast at 8:00, dinner at noon, and supper at 5:00 without fail. So many, many fond memories. As we converted the farm into a blueberry farm and apple orchard, we have been blessed to be a part of so many others creating memories. Today, a new memory was created that will forever be one of my favorites. We met Zach and Rebecca this afternoon as they came out to pick. Not long after they walked in the field they came back to the shed. 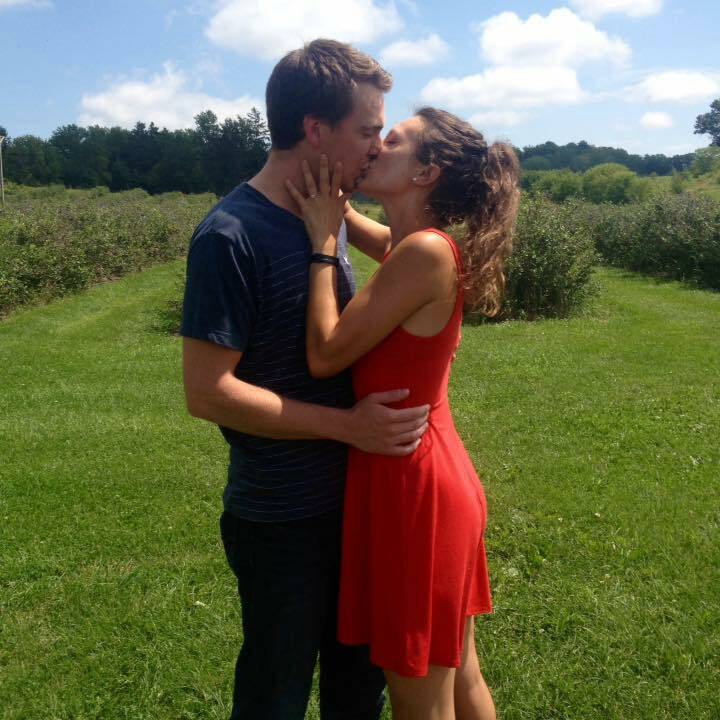 Zach proposed to Rebecca while picking blueberries ….and she said YES!!!! Such an exciting day! So very special to be a part of such an amazing event. Zach and Rebecca – many congrats and we wish you a lifetime of happiness!!! Here’s to Love being in the Air!! !